Becky grew up in Michigan and has been here most of her life. 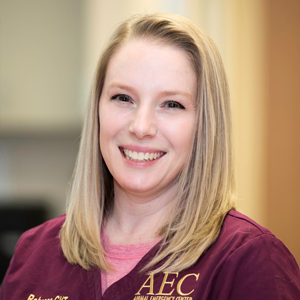 She and her husband relocated to Arizona for a while where Becky received her CVT certification (certified veterinary technician license). She has worked in single and multiple doctor practices, and was responsible for training, ordering, process implementation and inventory. While in Arizona she learned how to work with exotic pets and assisted with birds, turtles and chickens. After returning to Michigan, Becky joined AEC's staff in 2013. Becky loves emergency medicine because "you never know what is going to come in on any given shift, but we are able to help any client that is in need". She enjoys making clients comfortable at AEC, especially if they are coming from a stressful situation involving their pet. Becky is a horse enthusiast and owns a horse, two dogs and one cat. She and her husband enjoy riding their motorcycle, and Becky also enjoys gardening and spending time with family and friends.